Global knives were created in Japan in 1985 and continue to be manufactured and designed in Japan today. They have a phenomenal reputation all over the world and specialise is high quality, beautifully designed knives that are suitable for amateurs and professionals. They use their own specially created CROMOVA 18 metal and an original acute edge to give their products lasting sharpness and a strength that sets them apart in the knife world. 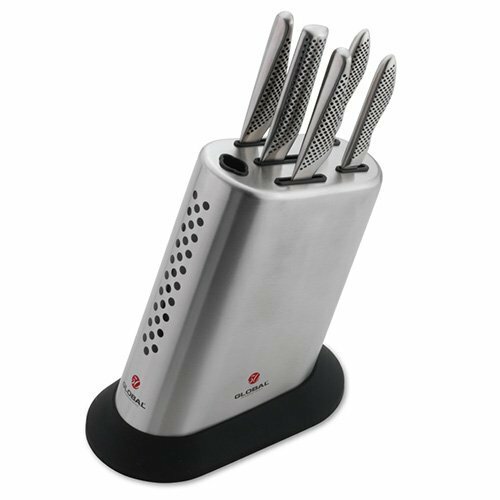 This knife block sets is one of the few that have been brought out especially to celebrate Global’s 30 year anniversary and it’s a great time to be buying their knives as the offers available on the products should not be missed. This particular set is in Global’s typical ultra-modern style and comes with an excellent knife block. This block is for those keen amateur and professional chefs who like beautiful yet simple and straightforward tools. This set looks sleek, well designed and like it will enhance your cooking ten-fold. It would suit a highly modern kitchen but also stand out in a good way in a more traditional kitchen. Although this set comes with a good selection of knives that probably won’t leave you wanting – it also has an additional slot for either a Global sharpening steel or a set of Global shears. This strikes me as bizarre and a bit annoying as it means you either have to buy an extra product or have an odd looking empty slot. In my opinion they should either have included the extra item or excluded the extra slot. Still, it gives you the option to choose which extra item you want and doesn’t particularly detract from the whole. The knives fit in their slots very well which is crucial for a decent knife block as so many are ill-fitting, leading to damage. The block also stands well on the kitchen counter and won’t be knocked over by accident. It has the same punched hole design as the knives and all together its looks very smart. The bread knife, although beautiful to hold, is 4cm shorter than the majority of bread knives and although I wouldn’t call this a problem per se, it is noticeable. It’s actually very useful for rolls and small loaves but in very wide, flatter loaves it can be annoying. Still, it certainly doesn’t put a downer on things. While the bread knife is shorter, the paring knife is 9cm while a lot of paring knives I see are 8cm. I actually like them shorter because it means they have more distinct uses that a utility knife. Nevertheless, this is a precise and nice tool to use. The utility and veg knife are both excellent and do their work much faster than cheaper, lower quality knives. The sharpness is astounding. The 20cm cook’s knife is perfection…the only bad thing I can say about it is that without a bolster of any kind, you feel a little vulnerable with anything less than dry hands. The lesson there I suppose is never use a knife with anything less than dry hands! Global stand apart from the competition using two unique design techniques. Firstly, they weight their knives using sand in the handles and each one is so flawlessly done that I have to admit, for weight, they are up the top of my favourite brands. The second unique attribute to Global knives is that the points are acute rather than bevelled. Not only does this allow them to keep their sharpness for longer, they actually appear to cut better too. Global knives are a dependable brand and they should last for many, many years if looked after properly (I.e. don’t put in the dishwasher!). This is a visually stunning set than doesn’t mess around with fancy looks, it’s stylish but no-nonsense and works excellently. 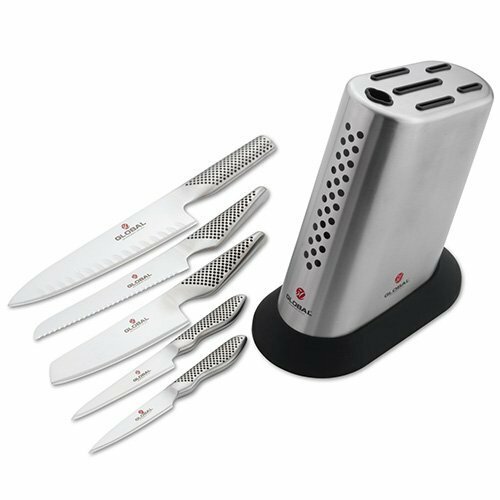 If you’re looking to revamp your kitchen or are just fed up with poor quality knives, this anniversary 6 piece set is a fantastic deal. You get Global’s excellent designs for a bargain price – these really are professional quality knives. Although the extra slot seems a bit pointless, it does give you the option of choosing whether you want a pair of shears or a sharpening steel and flexibility is always nice. Overall I would highly recommend this knife set and for the price you really can’t complain – these are expert knives that will have you chopping like a pro and throwing dinner parties like they’ve only just been invented.